One of the most visited places in the Arlington National Cemetery is the Tomb of the Unknowns. The changing of the guard is a moment that is awaited by the big number of tourists visiting the cemetery, created after the Civil War of the US. It is a simple ceremony, but full of solemnity and respect. Keep in mind that this place is visited by over 4,000,000 foreign tourists and Americans. The memorial to the Unknown Soldier, is made of 7 pieces of granite, with a total weight of 72 tons and was opened to the public in the year 1932. 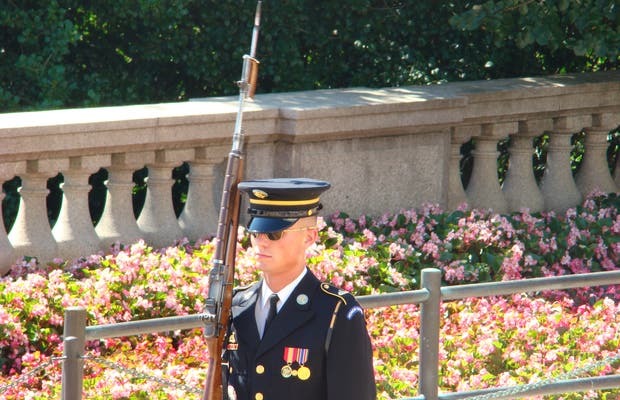 The Unknown Soldier has a permanent guard 24 hours every day of the year.